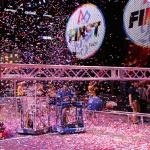 Two FSR teams– MOE FRC and MOE FTC– travel to St. Louis this week to participate in FIRST World Championship competition events. MOE FRC is scheduled to compete in qualifying rounds on the Galileo field. MOE FTC is scheduled for qualifying rounds on the Edison field. In addition, two Delaware students, Amy Andrews and Emma Onstad, both from FTC team 8528 are competing for FTC Dean’s list award. The 10 award winners (chosen from 101 finalists) will be announced at the FIRST Championship Opening Ceremony, Thursday, April 23 at 6 P.M. in the America’s Center, Edward Jones Dome in St. Louis. Best of luck to all our students and teams– and have fun! This entry was posted in News and events and tagged 2015, competition, FIRST, FRC, FTC, robotics, STEM by fsreditor. Bookmark the permalink.